The Clippers’ Blake Griffin showed some frustration during Sunday’s 114-109 victory over the Washington Wizards at Staples Center. In his first game back after missing the previous 45, Griffin scored just six points on 2 of 7 shooting. He was obviously dismayed after some of the misses, but he seems to understand everything is not going to come back all at once. Griffin had not played since Dec. 25. He sustained a partially torn left quad tendon that night playing against the Lakers. It is still torn, but it’s good enough for him to play through the pain. He said Saturday it’s an injury that may have to be addressed in the off-season. Griffin also had five rebounds and four assists Sunday in 24 1/2 minutes. – Blake Griffin returned after missing 45 games because of two injuries and a four-game suspension. He scored six points on 2 of 7 shooting in 24 1/2 minutes. He also grabbed five rebounds and doled out four assists and had a hard time handling a couple of passes. He was rusty, but that was to be expected. He at times became frustrated, which was also expected because he’s very hard on himself. He had a couple of fine moments, like when he caught a lob pass from Chris Paul in the first quarter and threw down a dunk. He had a behind-the-back pass to Paul in transition in the third quarter, the ball then ending up in the hands of J.J. Redick, who buried a corner 3-ball. – One of the prettiest plays of the game came when Jamal Crawford hit DeAndre Jordan with a lob with 57.7 seconds left to play. Jordan was farther out than usual, so he had to throw down what can be best described as a long, monstrous dunk for a 110-104 lead. The two were talking about the play in the locker room afterward. They were stoked, to say the least. – Nice game by Chris Paul. The point guard, who suddenly had Griffin back on the court with him, doled out 12 assists to go with his 27 points on 10 of 19 shooting. Griffin only made two baskets, and Paul had the assists of both of them. Paul scored 10 of his points during the all-important fourth quarter. – Sixth-man Jamal Crawford is averaging 13.9 points on the season. But Crawford, 35, is averaging 18.0 points over the past five games. He scored 19 in this one on 6 of 12 shooting – 4 of 7 from 3-point range. Nine of those points came when they counted most, in the fourth quarter when the Clippers were holding off a Wizards team trying desperately to remain in the hunt for an Eastern Conference playoff berth. Crawford made 3 of 4 from the field in the quarter, all from 3-point range. He also had three of his six assists. It was terrific work for just over 25 minutes of play. – The Wizards shot a respectful 45.7 percent from the field. But their guards – Bradley Beal and John Wall – combined to shoot 7 of 30 (23.3 percent). Beal shot 2 of 16, Wall 5 of 14. Some of that was good defense, some of it was just poor shooting. “We missed a lot of good looks, but we stuck with it,” Wizards coach Randy Wittman said. “I felt pretty good about the shots we missed, and I knew if we kept getting those shots in the second half that we could make a game of it.” Washington did just that, eventually pulling to as close as three points (110-107) with with 47.4 seconds to play after trailing by 12 (104-92) with 3:47 left. BONUS TAKE: The Clippers (48-28) clinched homecourt advantage for the first round of the playoffs with this victory. Blake Griffin didn’t play all that well Sunday in his first game back after missing the previous 45 because of two injuries, and a four-game suspension for fracturing his right hand on the face of team assistant equipment manager Matias Testi in January. Griffin scored just six points on 2 of 7 shooting, grabbed five rebounds and doled out four assists in 24 1/2 minutes of the Clippers’ 114-109 victory over the visiting Washington Wizards. Griffin knows he didn’t have one of his typical games, which would have been way too much to ask. He was just thrilled to be back after not having played since Christmas. 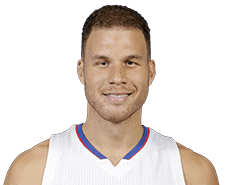 Griffin sustained a partially torn left quad tendon on Christmas against the Lakers and had not played since then. The tendon is still torn, but it’s good enough to play, even if there’s some pain involved. He was asked how it felt post-game. Blake Griffin played 11 minutes and two seconds in the first half Sunday against the visiting Washington Wizards. It was Griffin’s first action since Christmas, and he had missed the previous 45 games. Griffin scored two points on 1 of 2 shooting, grabbed four rebounds and doled out two assists for the Clippers (47-28), who took a lead of 60-49 over the Wizards into the halftime break. Chris Paul and J.J. Redick scored 13 points apiece in the half and Jamal Crawford scored eight off the bench. Marcin Gortat led the Wizards (37-39) with 10 points and Nene scored eight.